The PowerPoint I used for a plenary at the Extensive Reading seminar in Taipei, Taiwan, May 2017 is large. HERE is part one and HERE is part two. And here is the "Mountain Dew Memory Test" video that I used in the session. And Elmo's intro is here. I got the idea for this poster when reading something by a colleague, Atsuko Takase. For a PDF to print out, click here. 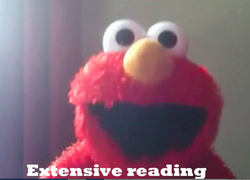 I had this video of ELmo saying "Today's presentation is brought to you by the letters "E" and "R" for a workshop I was doing. A bunch of people liked it on Facebook so it occurred to me that people might want it to use in their own ER classes (in which case, "presentation" means "the stuff I'm telling you at the beginning of our class" instead of formal "conference session". Anyway, if it is useful, help yourself. CLICK HERE for the download. This is a .mov file. For the WMV version (for PC), CLICK HERE. Extensive Reading (ER) means reading a lot of easy, interesting books. 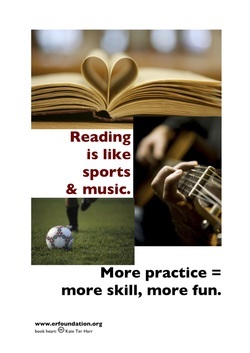 The key is to build reading fluency and enjoyment. 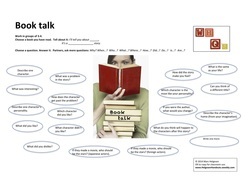 This is a speaking activity that lets students, in pairs or small groups, share the books they've been reading. Note that the questions on the left are easier. Those on the right are more challenging but often lead to more interesting conversations. Click here for the international version. Click here for the version for Japanese learners. Good readers read "wide." -- They read many different types of stories. To encourage my students to do so, I ask them to fill out a "my genre wheel" form they put in their notebooks. The get a set of dot seals which they put on the wheel, one for each book they read. For a copy of "My genre wheel", click here. 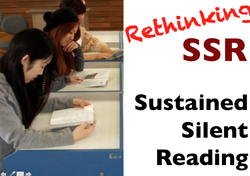 At the 2nd Extensive Reading World Congress, I did a Featured Speaker talk called "Rethinking SSR (Sustained Silent Reading). Some participants asked for the PowerPoint to use with colleagues. You can download it here. If you use it, please let people know where you got it. Thanks. I've presented on ER for many groups in Korea, Japan and recently in the Philippines and Indonesia. Here is the PowerPoint presentation I used in the Philippines: ER: Extensive Reading/Effective Reading. Here is the version I used in Indonesia. 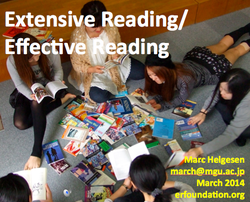 ER: Extensive Reading/Effective Reading - Indonesia. (They are almost the same but some of the artwork was modified to make the pictures more appropriate).You may want to use parts of it with your own students. Unfortunately, the Mountain Dew commercial used to point out the importance of knowing what you are reading (looking) for doesn't seem to be on youtube anymore.